I’ve probably mentioned before how much I love my Crock Pot/Slow Cooker. There’s nothing better than throwing your meal together, walking off and leaving it, then coming home to a house that smells wonderful! 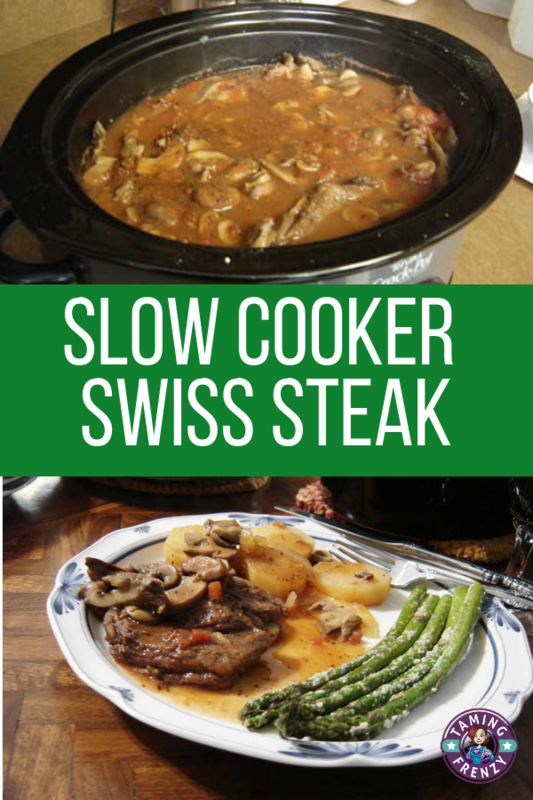 This slow cooker recipe for Swiss Steak makes a great meal even when you’ve got company coming. This post contains affiliate links. I make a small commission at no charge to you should you make a purchase. Cut steak into serving size pieces. Sprinkle with salt and pepper. Put potatoes in bottom of slow cooker. Add steak, celery, onions, mushrooms, and carrots. Add canned tomatoes and tomato sauce and sprinkle with garlic powder. Cook on low for 8-10 hours or on low for 4-6 hours. I am a huge fan of slow cookers. In fact, my family makes fun of me sometimes because I use mine so often. But I do have to admit a certain satisfaction when my daughter asked for her own slow cooker when we moved her into her first apartment. Score one for mom! If you like this recipe, please save it to your favorite Pinterest board and share it with your friends.